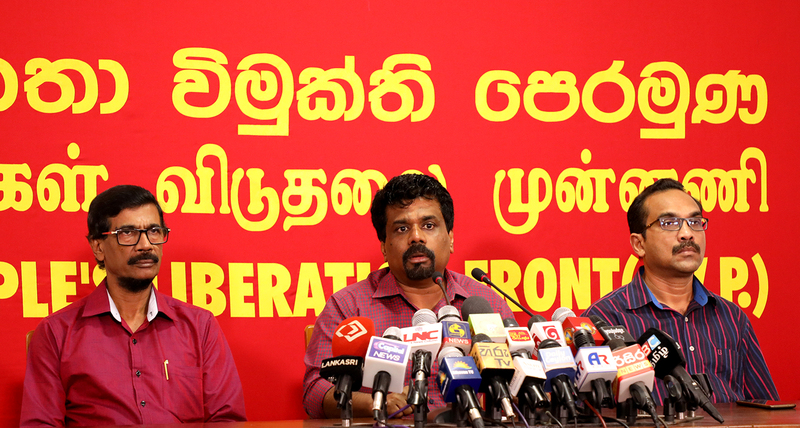 The President should apologize to the whole Nation for the political crime he committed says the Leader of the JVP Comrade Anura Dissanayaka. He said this at a press conference held at the head office of the JVP to express the view of the JVP regarding the interim injunction order given by the Court of Appeal restraining Prime Minister Mahinda Rajapaksa and his Cabinet from functioning until the hearing is concluded. Comrade Anura Dissanayaka said, “At the very moment the political conspiracy was committed with the mediation of President Maithripala Sirisena, the JVP resolved that the political conspiracy would be defeated and all moves that would be taken to consolidate democracy in the country. In a situation where the President doesn’t act according to the Constitution the only action, we had was to seek redress from the Court of Appeal. With the mediation of 122 MPs, we stated that the NCM presented in Parliament had been passed and requested the Court of Appeal to declare that Mr Mahinda Rajapaksa has no power to act as the Prime Minister and his cabinet cannot act as ministers. Accordingly, the Court of Appeal has given a very important decision. The setup government has been barred from functioning until the hearing is concluded. Functioning according to arbitrary, distorted thoughts of President Maithripala Sirisena has been halted. Despite a NCM had been passed in Parliament and the Speaker had announced that there was no prime minister or a cabinet, the President convened the cabinet. Various decisions were taken. The ‘token’ ministers commenced giving employment so that they would have cadres for their future political projects. Do people have to accept the administration of such a ‘token’ cabinet? Do we, as citizens of this country, have to accept an illegal, unconstitutional clique that doesn’t have a majority in Parliament administer our country? Can the President rule the country with whichever group he fancies? The General Secretary Comrade Tilvin Silva and the National Organizer Comrade Bimal Rathnayaka also participated.